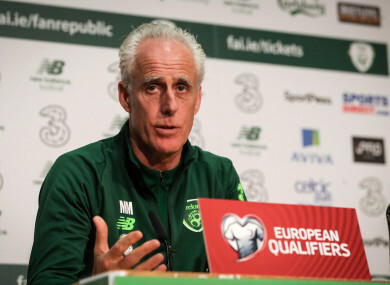 Mick McCarthy talks to the media ahead of tomorrow night's Euro 2020 qualifier against Georgia. MICK MCARTHY HAS called on Irish fans to get behind the team amid rumours that tomorrow’s Euro 2020 qualifier against Georgia at the Aviva Stadium will be interrupted by protests against John Delaney and the FAI. The Times Ireland today reports that some Irish fans intend to throw tennis balls on the pitch during tomorrow’s game to express their anger with how the game is run in Ireland, with some fans calling for a boycott of the fixture. There were at least two banners critical of John Delaney evident among the Irish fans during Saturday’s game with Gibraltar. “We don’t want it to affect the performance. McCarthy was unwilling to discuss the issue further, although did joke “that’s going to be a hell of a title for his door, he’ll have to have some wide door” when the first reference was made to John Delaney’s new role as the FAI’s new Executive Vice-President. On Saturday evening, soon after the full-time whistle blew on Ireland’s game with Gibraltar, the FAI circulated a statement to announce that John Delaney had stepped aside as CEO and assumed this new role, as was recommended by an external audit of the FAI’s governance structure. The review was commissioned by the FAI in February. The statement, however, did not say that the restructuring was motivated in any way by the controversy that has engulfed Delaney in the last week, which began with a Sunday Times story which revealed that Delaney had paid a personal cheque worth €100,000 to his employers in April 2017. The FAI clarified that the payment was a “bridging loan” to cover a short-term cash problem, and was repaid to Delaney in full in June 2017. The players, meanwhile will be unaffected by any in-game protest according to their goalkeeper, regardless of whether they involve tennis balls or otherwise. Elsewhere, there are uncertainties regarding Shane Duffy’s involvement in tomorrow’s game. The defender didn’t train with the Irish squad today, and McCarthy confirmed he has returned from Gibraltar with a sore ankle. “Shane has a sore ankle. We’ve left him out today. He’s going to have a precautionary scan to see if there is anything serious, I don’t think there will be. Email “McCarthy calls on Irish fans to back the team amid rumours of in-game protests against FAI”. Feedback on “McCarthy calls on Irish fans to back the team amid rumours of in-game protests against FAI”.